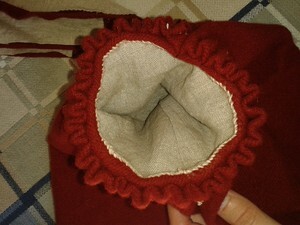 Challenge #8 in The Historical Sew Fortnightly was "UFO" - UnFinished Objects, due 1st May. I had the perfect project, I had a fairly realistic schedule, I had the materials - and I still failed miserably as you can see from the date of this post. But it was still worth it. Warning: very long post ahead! I mean - look at it! Ever so pretty! And so I started. But first: the fit isn't exactly easy to achieve. The sleeves are kept in place by power of will! Second: I worked in wool. 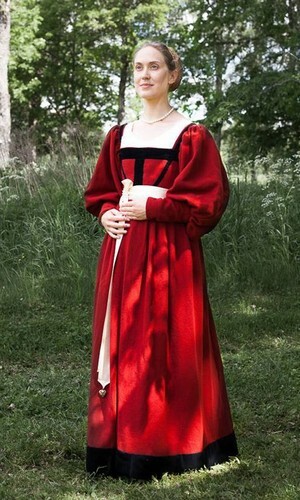 Wool+this type of dress = massive risk of producing something rather Landsknecht-y. Which can make nice stuff, for sure, but didn't at all suit my needs here. The result, in 2013, was that I had a fullblown rage-quit and the dress ended up in a bundle in the fabric cupboard. Which was just as well, since the event turned out to be during the hottest week that summer - 30 degrees C all days. But then came the challenge, and a new event, this year at a more "can be warm can be awfully cold" time of the year here in Sweden, so out of the stash the project came. I thought about it, I asked friends who's sense of style I trust and for once they all said the same when I tested my idea: If you can, do go Italian! 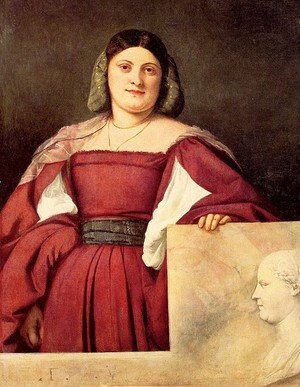 "La Schiavona" by Titian, 1511; An unknown lady from about 1520 by a likewise unknown Venetian artist; and a detail from Messer Masilio and his wife by Lorenzo Lotto, 1523. They share the big sleeves and a waistline which is at the natural waist or just a tiny bit higher, as well as the wide and deep, square neckline - at least in front. Not always in the back, to my immense relief. I was stuck with fabric that had already been cut, but I figured it could be done. The layout as it was. At the top the big pin-on sleeves that rescued the project. At the bottom a strip of fabric intended for the hemline, since I hadn't got fabric enough. 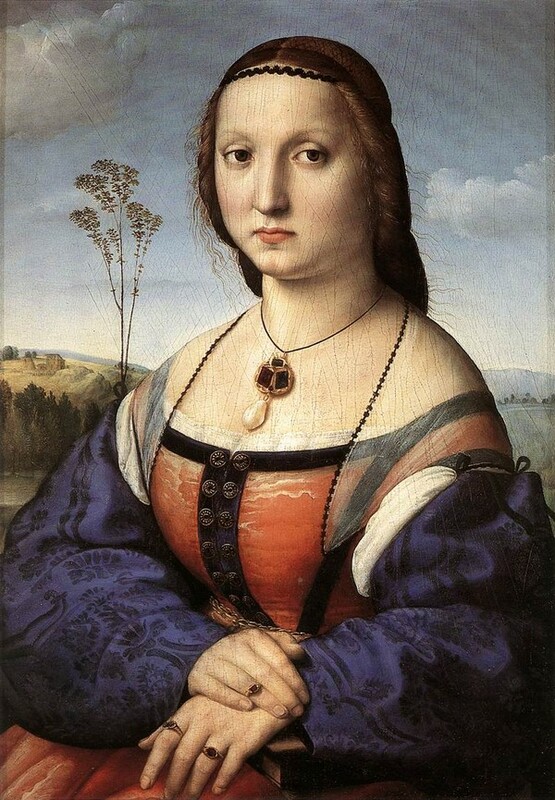 The original bodice. See why I ragequitted? I mean - look at the fit of that thing?! Or, rather, obvious lack thereof. 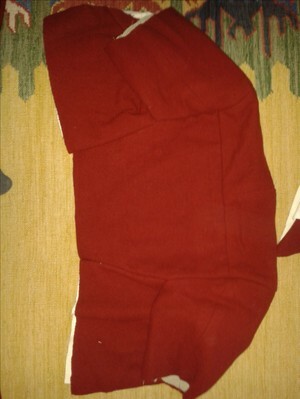 I ended up ripping apart all the seams except the horisontal one in the back. The back/side seams were opened, taken in an inch and spiral lacing was added on both sides. Then frantic pinning ensued, to figure out a) the sleeves and b) how much I would dare to take in when closing the front, since the friends mentioned above was equally in agreement about back closure being most pretty. 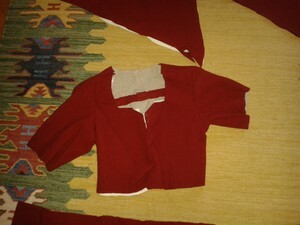 The big pin-on sleeves supplied the fabric for the poofy upper sleeves, the original sleeves with their lining became the lower part of the sleeve. 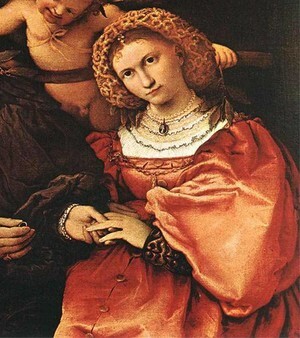 The upper part is unlined. 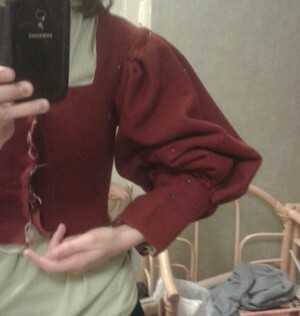 The bodice is lined with linen and interlined with *shudder* cotton. I honestly didn't think, it felt sturdy when I grabbed it from the stash. 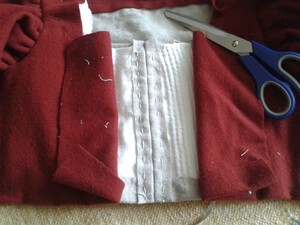 The upper and lower parts of the sleeves were finished individually, the upper sleeve was pleated to the lower (the half-in half-in half method) into some kind of cartridge pleating and then whipstitched in place. It was somewhere here that my schedule collapsed. I'm part of a charity that volunteer to look for people who's lost and that meant that due to unlucky events, all my weekends set aside for sewing instead was spent witha search party. Not much sewing was done. 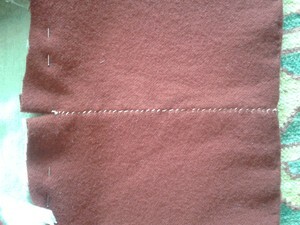 Next problem was the front closure - the original cut was supposed to have hooks and eyes in the front. I closed it, lining and interlining together for strenght. Oh, and as you can see I went a bit overboard. The stupid interlining stretched, so I decided that HA or not HA - this was the time to try hemp rope stiffening. So I did. I then closed the front over it all. Now, I had a visible seam in front. I didn't want that, so I desperately looked for ANY source that'd give me an excuse to cover it. Can't say I really found one, but I decided to use guards anyway. 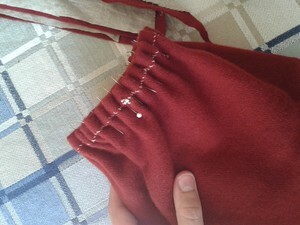 I then gathered the skirt with roll pleats and whipstitched it to the bodice. 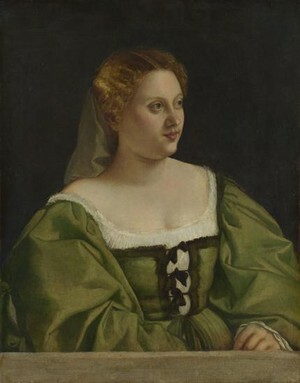 The Rafael painting is not at all the same type of dress, but at least vaguely the sime period. In the end I added a strip of polyester velvet to the bottom of the skirt to make it long enough. In the end I finished about two and a half weeks after deadline, but it took me some time to finish this post as well. The finished dress turned out as intended, more or less. It's warm and cosy, but not too cosy and don't be fooled by my extremely long back - the waist is slightly above my natural waist which makes it possible to move very freely, even if it's a rather tight fit when fully laced. The finished dress, seen from the back. And the front. Colours are more true to life in the picture above and there is a visible camisia underneath - it's just that the bright sunlight ate it! 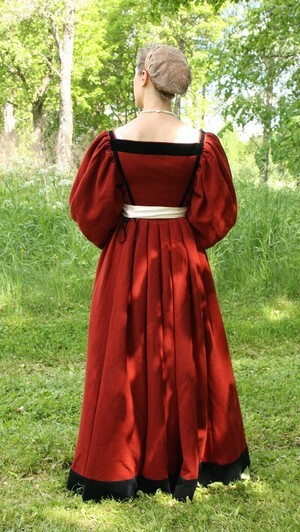 Fabric: Mainly red wool. Bodice and lower sleeves lined with undyed linen, bodice interlined with cotton something and hemp string. 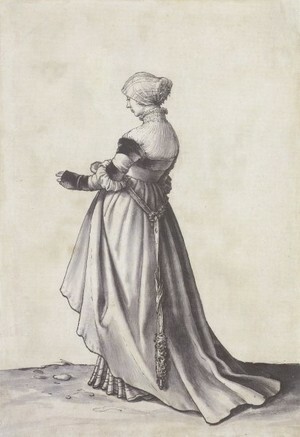 Skirt and upper sleeves not lined. Polyester velvet for the bottom guard. Notions: Velvet ribbon of varying width, from stash. Linen thread, from stash. Satin ribbon for belt, pendant as stand-in for a pomander. How historically accurate is it? 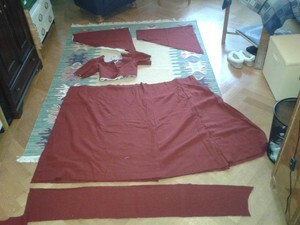 : Apart from the panels of the skirt, the entire thing is hand-sewn. 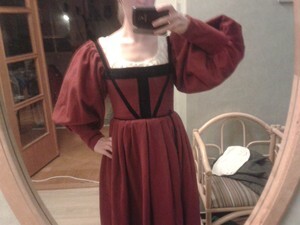 Plus for most of the materials, minus for the non HA-solutions in the bodice and such. I'll be kind and say 80%? Total cost: Everything technically from stash. Red wool bought five years ago, velvet last year - but say about 45 euros for the wool and 15 for the velvet. Ribbon for lacing: about 7 euros, I hadn't the time to look for a reasonable price. Total cost: around 65-70 euros, though it didn't feel like it.